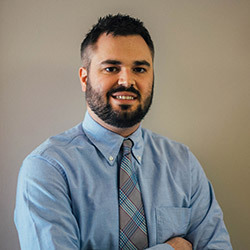 Dr. Daniel J. Berquist entered the dental field in 2013 and has practiced dentistry as part of his family dental practice since that time. He loves offering gentle, compassionate dental services for his patients. Being able to connect with them on a daily basis and develop long term relationships with them are the most rewarding parts of his job. A native of nearby Crown Point, IN, Dr. Berquist attended Olivet Nazarene University where he obtained a BS in biology. He earned his Doctor of Dental Surgery at Indiana University’s Dental School. Outside the office, Dr. Berquist enjoys spending time with his wife, Dani, daughter, Lydia, and Yorkshire terrier, Lila. When he has time, Dr. Berquist enjoys spending time with his family and friends near the lakeshore, hiking, and fishing.